Andrew Jordan has won the 2013 Dunlop MSA British Touring Car Championship having surged through the field to take ninth in a final race that was won by Gordon Shedden. The lights-to-flag victory for Scotsman Shedden was enough for him to clinch second in the standings ahead of Jason Plato, but the headlines belong to 24-year-old Jordan who fought off the challenge of four former champions over the final weekend of the season to claim his maiden BTCC title. After an incredible second race in the day that saw Jordan face his first non-finish of the season, the championship was set to go down to the wire with double winner Plato and pole-sitter Shedden still in with a chance of stealing the crown away from the Pirtek Racing driver. Shedden did his job leading from start-to-finish, although under intense pressure throughout from the impressive Jack Goff, but the Honda Yuasa Racing driver needed Jordan to face further heartache in order to take the title. Starting from the back of the grid, Jordan picked off one car after another in the opening laps and was up to 11th just five tours in. Plato needed to haul his MG into the podium positions to keep his hopes alive but the double champion began to fade after mid-distance. Shedden was fending off Goff while Jordan made his way up to ninth, and his team quickly told him over the radio that the position would be enough to win the title. Plato had no answer, dropping behind Jordan late on, and although Shedden stormed to another stellar victory it was Jordan that had the fans on their feet at the finish. Goff rounded off his best day in the BTCC with second ahead of Airwaves Racing’s Mat Jackson. Colin Turkington bounced back from his own championship disappointment to claim fourth ahead of Aron Smith’s Ford Focus. Two Toyotas in the shape of Dave Newsham and Adam Morgan followed, with the BMW of Rob Collard taking eighth ahead of today’s stars Jordan and Plato. 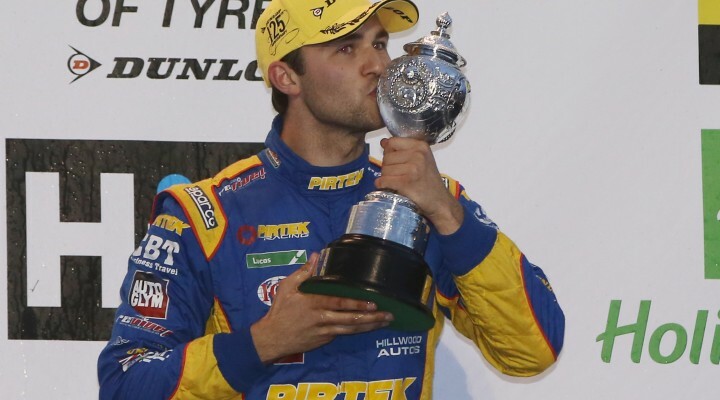 Jordan added the Independents’ Drivers title to the overall championship and his Pirtek Racing squad won the Independents’ Teams trophy. There was some consolation for Honda Yuasa Racing, who won the Manufacturers’ and overall Teams’ titles. The likeable Lea Wood also raised the roof as he won the inaugural Jack Sears Trophy, which was presented to the Hereford-driver by Sears himself – the first ever BTCC champion back in 1958.